Supervisor Hillary Ronen is living in fear. Her husband takes their young daughter to school nearly every day on the back of his bicycle and, nearly every day, she’s haunted by mental imagery of the two of them being doored or sideswiped or otherwise coming to grief on Valencia Street. San Francisco’s major cycling artery is also ground zero for Uber and Lyft drop-offs and pick-ups, a mixture about as combustible and ominous as locating a match factory next to the lighter fluid depot. These are the sorts of things that wander into Ronen’s mind during endless public comment sessions in Board of Supervisors meetings. Valencia Street forms the border between Ronen’s District 9 and Supervisor Jeff Sheehy’s District 8. 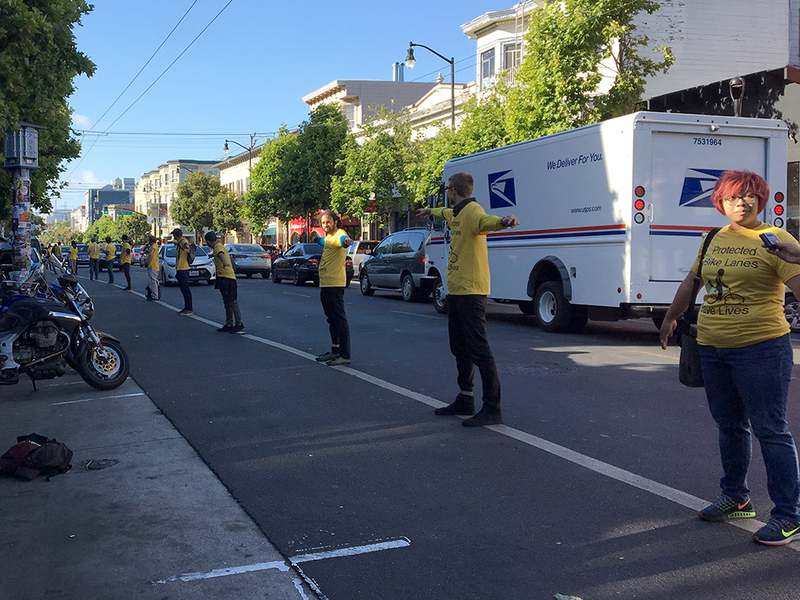 Sheehy — who worked as a bike messenger when he arrived in this city in 1988 to underwrite food, beer and $300-a-month rent — recently donned an aggressively yellow shirt and served as a human protected bike lane. So, the supervisors overseeing both sides of the street are on the record in calling for protected bike lanes to keep Ronen’s family and Sheehy’s bike-messenger successors from tragically commingling with some dude in an Uber. Everyone says they want the same thing — but San Francisco is a peculiarly political town. And, very much in spite of our self-styled reputation for progressiveness, it’s also a place that’s often stridently opposed to change. Right now, everyone is, ostensibly, on the same page. But this book is long. Those lanes were installed in 1999. Maher is still alive and well. So, clearly, this city’s relationship with cycling and cyclists has transformed, as has Valencia Street. Rather than mortal opposition, our elected leaders and city staff are growing increasingly amenable to cycling and are keen to reach out to what is now a constituency. But this city has a number of constituencies and, in this neighborhood and, specifically, with this proposed project, they’re commingling to the same degree as Ubers and bikes. This endeavor may end nearly as badly. On Nov. 13, the Board of Supervisors will, all but certainly, greenlight a proposed $145,000 study on how Valencia Street’s bike lanes could be upgraded. The San Francisco Municipal Transportation Agency (SFMTA) will be the body undertaking the work, but the Board expedited this process by offering to pay for the whole thing; Sheehy’s office will kick down $50,000 in transportation improvement funds. So, it’s clear that getting this study started, tout suite, is important for members of the board. But that’s when things slow down. The study’s timeframe calls for its results to be presented in December of 2018. The crucial “stakeholder outreach” component of this study — i.e. finding out who is going to declare war on whom depending on what the study concludes — won’t be completed until September of next year. Actually doing the stuff the study recommends we do, if we actually do it, will take years more. And, all during that time, the scenarios that necessitated the study won’t be improving. And perhaps that’s why, last week, Ronen proposed that Uber, Lyft and other app-hailed services stop picking up and dropping off riders on Valencia and instead pull onto the numerous side streets. For San Franciscans who would have reveled at the sight of Travis Kalanick slinking off via the perp walk, this proposition was likely well-received. But Ronen knows she has no regulatory authority over app-hailed services; that’s the domain of the California Public Utilities Commission. And striking a “deal” with Uber et al. is a bit like Lando Calrissian trying to drive a hard bargain with Darth Vader. None of the city’s progressives, in fact, have much faith in Mayor Ed Lee to demand significant concessions from any manner of tech company. And yet, those countless Ubers and Lyfts dropping off countless folks on Valencia aren’t doing so merely for the joy of driving through the Mission. “If you think restaurants are not going to freak out about not having Lyft and Uber doing pick-ups, well, that’s crazy,” summed up a longtime city official. Ronen’s proposal was inspired by the well-meaning and understandable desire to keep cyclists from being run down. Everyone wants that. But no one wants to give up something that’s working for them. And this is why a year of studying this and proposing “solutions” may move everyone further apart rather than closer together. Installing protected bike lanes of the sort everyone professes to want on Valencia is going to require overcoming two sorts of obstacles: logistical and political. It’s not clear which will be more difficult. Without tumbling too far down the rabbit hole of traffic minutiae, let’s discuss the physical problems first. These are significant. Several blocks of Valencia sit below overhead power lines and bus wires. This sets up a battle both with the SFMTA and the Fire Department. Pushing traffic further toward the middle of the street would potentially require a firefighter’s ladder to a burning building to go right through those wires — which is a nonstarter. There’s a long list of proposed cycling lanes that the Fire Department has held up over similar concerns, including a stretch on Upper Market that was approved by the Board and had the money earmarked and ready to go. Furthermore, any attempt to move those wires could trigger California Environmental Quality Act requirements. That’ll have a molasses effect on the process. So, there’s trouble brewing with public city institutions. And, on other stretches of Valencia, private institutions may be spoiling for a fight. On some blocks of Valencia, there’s a center turn lane. On some there isn’t. Removing that lane would allow the installation of bike and buffer zones without losing parking. But on the blocks where it’s not there, parking is going to have to come out. That will rankle people. We’ve come a long way from Maher’s “over my dead body” era. There have been winners and losers over the past two decades as Valencia Street has hyper-gentrified. But, writ large, nobody can say that increased cycling amenities are incompatible with booming business. Writ small, however, removing parking spots irritates business owners. Especially, City Hall officials note, if it’s their parking spot, the place in front of their business they arrive at early in the morning and where they feed the meter throughout the day. Times are changing, but some things never change. Putting serious money into improving Valencia Street’s bike lanes, when much of the city isn’t nearly as safe and accommodating to cyclists, is a debatable decision. But Valencia is the backbone of the city’s cycling network and the place we’ve rolled out the green carpet for would-be riders. And, city officials tell us, if San Francisco can’t get it right on this street, then it can’t get it right, period. And let’s hope that, whatever we do, it’s done before Ronen is worried about her daughter riding around with a grandchild. The City just widened the sidewalks between 19th and 16th a decade ago, taking out the center lane. Much of that reclaimed space has been taken up by businesses. The notion of separated bike lanes everywhere all of the time with widened sidewalks and bus bulbs are yet more manifestations of a fashion fling by the SFBC. The proposed treatment is having trouble on 8th Street. And on Valencia, with so much pedestrian activity, a separated bike lane would become an extension of the sidewalk, like 8th Street but worse. You are not alone in your views. I spoke with transit planners who avoid walking on Valencia because they can’t make headway while pushing a stroller. We can’t forget about pedestrians in all this, but they’re just one more group fighting for space. Interesting tangent on the widening of Valencia sideway, and then having much of the sparkly widened space being given over by restaurants for outdoor tables. that privatizes too much of the sidewalk. On a Street like Valencia with high pedestrian volume, at least 8 feet should be reserved for pedestrians. Planners should follow the example of Market street & Mission Street downtown. Market street has been “specialized” to prioritize mass transit and bicycles, while the parallel Mission street is for cars. The same example could be applied to the Mission. There are many parallel North/South corridors. Some could be specialized for Mass Transit, another street could be specialized to prioritize bicycles, and others could be for cars. Trying to redesign one street to accommodate all would be self-defeating, and not ideal. I observe bike riders regularly on Valencia and I can guarantee you 1,000% that quite a number of them will not ride within a protected bike lane. Will they be ticketed for riding outside of it? Not a chance in hell. I hate Uber and would never use it, but the notion of forcing pickups and dropoffs onto cross streets is fatally flawed, and I mean that literally. People will die because of drivers rounding corners too fast and smashing into traffic which is stopped due to congestion on cross streets created by stopped Uber cars. Uber cars will also be rear-ended hard as a result. Some of those cars will have passengers entering and exiting, and they will be maimed for life or killed. So we can’t do it because drivers are dangerous and cyclists won’t stay in their little pens that we made to protect them from drivers. It is not against the law to ride outside the bike lane. Why do you think that it is? Cyclists can legally leave the lane to pass, because there is an obstruction like a car blocking the lane (duh), because there is debris like broken glass in the lane or any other time for their safety. Learn the law please. Valencia is a disaster for everyone. The street is not safe after dark. Expensive restaurants are car magnets and they need regular delivery services. Not a good recipe for a bikers’ paradise. I avoid it but if there are limited turns on the street, how will the drivers get to the side streets? If cyclists don’t feel safe with cars, maybe City Hall needs to rethink the bike path program and separate bikes from the cars by taking them off the major arterial streets and putting them on the slower side streets. Allow the traffic to flow, free up public parking and give the bikes their own routes. At least try it on some streets and see if the friction goes away. Motor vehicles get the major streets, bikes get the minor ones, and pedestrians get the sidewalks. It doesn’t hurt to try a separation in some areas to see if the war between the modes does not calm down before things get really ugly. Use the money to fix the potholes and improve Muni service instead of painting the streets. I agree, cars can have Mission, Van Ness, Guerrero and Dolores. Bikes can have Valencia. What do you think? I got doored by an Uber passenger who decided to unload his passengers in the middle of the lane. Uber and Lyft have no right to violate the law and risk the lives of bicyclists legally riding in the bike lane. Time to stop private automobile traffic 100% on Valencia. There are more than enough cyclists to deserve a dedicated lane.